Today we have a grab-bag of photos by Aussie Tony Eales, whose notes are indented. Here’s a grab bag of odds and ends to keep the tank topped-up The first is a close-up of a Blowfly—I think from the family Calliphoridae. It’s interesting that there appear to be two distinctive types of compound eyes, the upper rows and the lower rows. The next is a cute little Cymbacha ocellata Crab Spider (family Thomisidae) building its bell-shaped retreat from a fresh green leaf. The next is one of my favourite terrestrial orchids, Dipodium variegatum. They have no leaves and are visible only when they put up their flower spikes. Next is a new spider for me that I saw for the first time only yesterday: Euryopis superba. They are very small (~8mm) and live under eucalyptus bark. This entry was written by whyevolutionistrue and posted on January 13, 2018 at 7:45 am and filed under arthropods, insects, photography, plants. Bookmark the permalink. Follow any comments here with the RSS feed for this post. Both comments and trackbacks are currently closed. 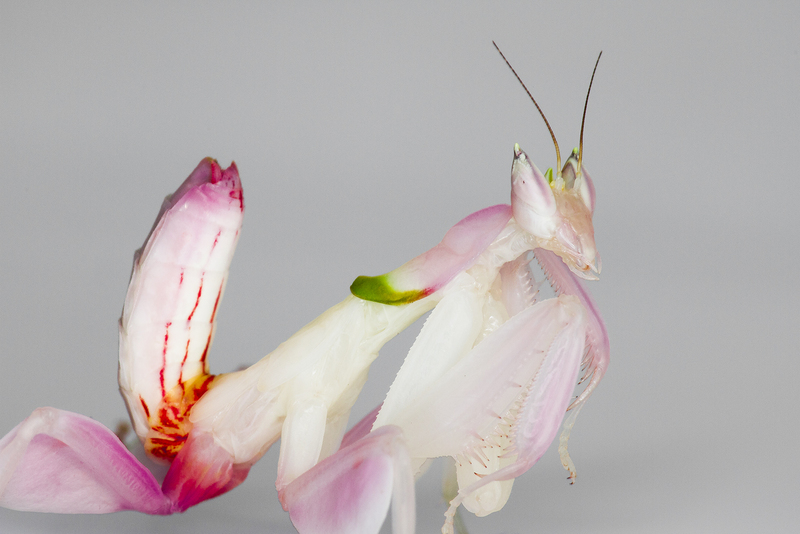 I found myself looking for a orchid mantis in the orchid image. Very nice! I was totally enjoying that. The especially small subjects are tough for good pictures, and these are done exceptionally well. Many insects with large compound eyes have different groups of ommatidia. I think (am not sure) that they specialize in things like viewing polarized light versus other varieties of light. Blow Fly part II… HERE IS Chrysomya rufifacies [ or Hairy Maggot Blow Fly or Hairy Sheep Maggot female & male [but I think it should be the male on the left & the female is on the right!] Notice the differences: The male has the clear demarcation of facets while the female does not have such a clear line. Also the male compound eye pair meet at the top of the head while the female eye pair do not. I couldn’t find anything as to why the eye facet demarcation in males nor why the sexes have different eye separations. Does anyone know why? The ommatidia [facets] are larger than ‘normal’ on the top half of the male eye. The ‘normal’ size is as per the female eye & the lower half of the male eye. Nocturnal mosquito species have fewer facets of larger size compared to diurnal mosquito species, but I suppose the reason for the male/female difference can’t be that – perhaps it’s so the males can track the females in flight for mating purposes? Is the orchid shown above parasitic on the roots of some other plant root system? Or is the green stem sufficient for its nutrient needs? Very interesting. My old 1965 copy of ‘Ecology of Soil Borne Plant Pathogens’ ed. by Baker and Snyder has a different term than Myco-Heterotrophy, namely ectendotrophic mycorrhiza! The fungi penetrate cells of the short roots of orchids where after a while the hyphae are broken down, and presumably digested. Whether it is fair to call the orchid ‘cheaters’ in this is moot, since it is the fungi which attack the orchid, no doubt encouraged by the orchid’s root secretions.